Striking 19th century manuscript school-girl map of Israel, Palestine, or the Holy Land. 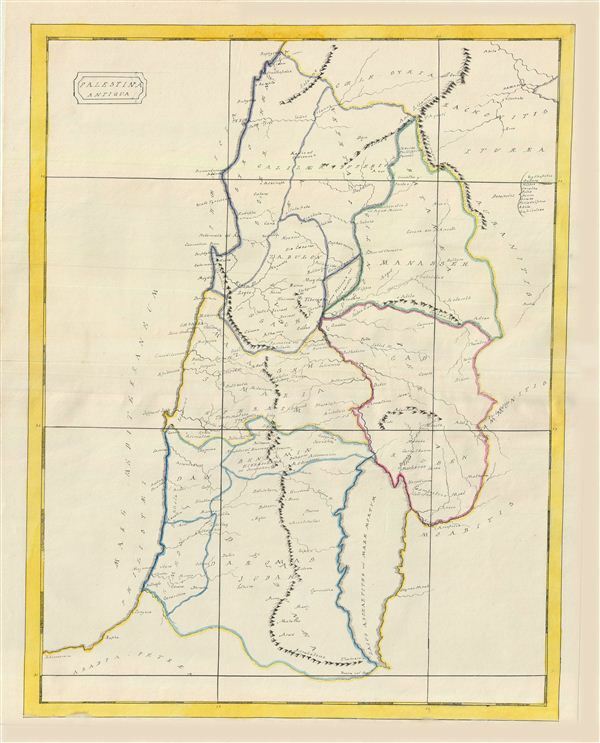 An unusual and beautiful 1823 manuscript map of the Palestine, Israel, or the Holy Land in Biblical times. The map generally follows the historical atlas work of the english cartographer James Wyld however is a fully independent and unique hand rendered production. The manuscript geographical data and detail throughout is altogether outstanding and completed in a fine hand adept at decorative text and the rendering of rivers and mountains. Centered on the Jordan River, this map covers the region between modern day Gaza and Lebanon and from the Mediterranean eastward roughly to modern day Amman Jordan. The map is divided and color coded according to the lands given to the tribes of Israel. In the upper right the ten cities of the Decapolis – the Roman era political entity governing the region – are identified. The map further identifies numerous classical and biblical sites throughout.